This is the LA1 User's Guide or operating manual for the LA1 display. LA1 is field re-programmable, and from time to time this document may be update with information on features that may have been added. To buy the LA1 go to the LA1 main page. The major elements of the LA1 display are shown at right. The two press-buttons are called the left or A and right or B buttons. The four characters of 7-segment display are called the digits, and the 30 element array of bars is called the bargraph. The small oval window immediately below the digits allows light to fall on an LDR (Light Dependant Resistor) which senses the ambient light intensity and adjust the display's intensity to match. The most common problem users experience is the nd, or no data, display as shown at left. It's caused when LA1 doesn't see data from WBo2. The solution is described below. The following information relates to LA1 firmware version 0229 or above. In the descriptions of the various displays, view names are shown in bold blue. Note: after re-configuration, some of the default behaviour detailed below may change. The default view is the display last saved, and is initially the AFR display. Immediately after power is applied to LA1 the Tech edge logo view appears. This lasts for two to three seconds, during which time the display brightness may change to suit the ambient light conditions. If the left (A) button is held down during the application of power, after approximately one second the tE view will change to show the current firmware's version number (0123 in this example), and LA1 enters config mode which is further described below. Subsequently, if the default view is either Lambda or AFR, and normal WBo2 operating conditions apply, the LA1 display will change from tE to the sensor heating in progress display. Depending on external conditions, this phase normally lasts 20 to 30 seconds. Other conditions, possibly error indications, may also be displayed briefly. After heating, the display will show the default view which is normally the AFR display shown here. The default view can be changed as described below. The bargraph will move anti-clockwise for richer mixtures, and clockwise for leaner mixtures. At the extremes of the rich or lean range just two red bars will be displayed. When the AFR (or Lambda) is richer or leaner than the programmed values, either of the two rich or LEAn limit indications is displayed. Pressing the left (A) button cycles through the four possible display views which are numbered 0 through 3. While the left (A) button is depressed, The number of the view that will be shown next is displayed in the left digit position - as shown at left. It's possible to change the default view that is presented each time the LA1 powers up. First, select the view you want to be the new default view by pressing the A (left) button. Then hold down the same A button for about 5 seconds until the 4-segment display shows "n---" (see images at left) where n is the new default view. Now unplug the LA1 and then plug it in again. The LA1 should now power up in the view you selected. Note: the "next" view number is displayed during the 5 second button-press, ignore this! The right (B) or logging button controls the on-board logging operation of WBo2 control units that support this feature. Giving this button a short press commands the WBo2 unit to start on-board logging. While the button is pressed, and for a short time afterwards, the text L on is displayed. While logging is enabled, the right-most decimal point of the 4 digit display flashes at about twice a second. Pressing the button again turns on-board logging off and also briefly displays LoFF. Pressing the right (B) logging button for around 4 seconds will display Lclr and the on-board logging memory will be cleared (for WBo2 units that support on-board logging). No Data - When there's no communications between LA1 and WBo2, the nd or No Data view is shown. This screen will only be seen when LA1 is expecting frame data to display but none is sent. WBo2 may not be connected, or WBo2 has been set up to generate the wrong type of data frames - this can occur if an old revision of the calibration utility is used that doesn't correctly reset WBo2's frame generation (or logging) mode to version 2.0 binary. One simple cure is to issue the s03e1 and the w commands. Battery Conditions - Among the conditions that can occur during sensor warmup are high (H bH) or low (H bL) battery voltage. Both conditions will cause WBo2 to switch off the sensor's heater to prevent damage. Running with the heater off, but exposed to exhaust gas, will cause soot build-up and eventually sensor failure. 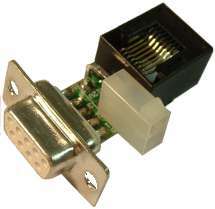 H hS = cable or sensor heater is Shorted to GND. 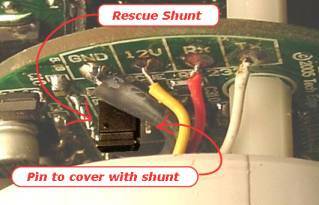 H hF = the FET heater circuitry is faulty. PID Status - The right-most decimal point on LA1 is called the status dot. Status information is continually produced by all WBo2 units. The condition of the sensor's Wideband and heater control software and hardware (including the sensor itself) is called its PID status. When WBo2's PIDs operate outside their intended range we call the condition PID unlock. From LA1 firmware revision 0130, LA1 shows both heater and wideband PID unlock status indications. Other WBo2 documentation may refer to this condition as a PID error but it is important to note it's normally associated with a condition the WBo2 unit has no control over. The Heater PID unlock is indicated by a SINGLE flash of the Status Dot. It can be caused by very rapid changes in heating or cooling of the sensor, and in some circumstances it may indicate a WB02 hardware error, a faulty cable (overheated cables can short internally), or sensor. The Wideband PID unlock is indicated by a DOUBLE flash of the Status Dot. It can be caused by rapid changes in the ambient air-fuel ratio (may occur under very rapid changes in throttle position). An ageing sensor will gradually respond more slowly to WBo2 control signals and can produce this indication too. A PID unlock is not necessarily an error, but if a PID unlock condition occurs regularly without an explanation then it should be investigated. LA1 can be field upgraded with new firmware, and its display modes re-configured, using the LA1 interface adaptor (*) shown at left. How the adaptor is physically connected both to LA1, a PC, and source of power is shown at left. Power is obtained from WBo2's two pin power cable, or a 12 volt power supply is used. Click on either of the images for an enlarged popup, or for the programming schematic here. Note (*) see here for info on the old interface adaptor. The WButil flash program can be used to update LA1's firmware, remembering that the LA1 must be in config mode for correct reflashing. Config mode on LA1 is entered by holding the left (A) button down ONLY while power is being applied to the display. Each time LA1 is power OFF, it will come back up in normal mode unless it sees the button depressed during its power up cycle. As reflashing is a two stage process (loading new code, then new EE-data), the A button should be held down until the reflash process enters the second stage where the EE-data is updated. Note that you may have to first rescue re-flash the code in (select the Flash Only? check box), and when that has completed, remove the rescue re-flash shunt and then select the EE Only? check box and flash in the EE data (of course remembering to hold down the A button during LA1's power-up to enter the correct mode). 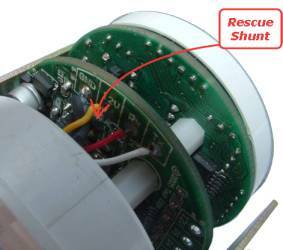 Yes it sounds complicated, but a rescue re-flash is a last ditch option that's not normally used unless drastic action is required. The WButil program provides support for LA1, and is used to change LA1's default behaviour and the display functions. There are two ways to program; either from scratch or by applying a pre-configured HXF file. Various HXF files have been produced by Tech Edge to handle the most common uses for the LA1 display including single and dual channel configurations. This section will be updated when the PC based configuration options (in the CONF.exe program) for LA1 are completed.